Meet Irv, the 2019 Limited Edition Bear! The Memorial's Bears for Nationwide Children's program helps raise funds for the Memorial Tournament Neonatal Intensive Care Unit (NICU) through an alliance between the Nicklaus Children's Health Care Foundation and Nationwide Children's Hospital. Each year there is opportunity to support the Memorial Tournament Neonatal Intensive Care Unit by purchasing the annual Limited Edition Memorial Tournament bear. 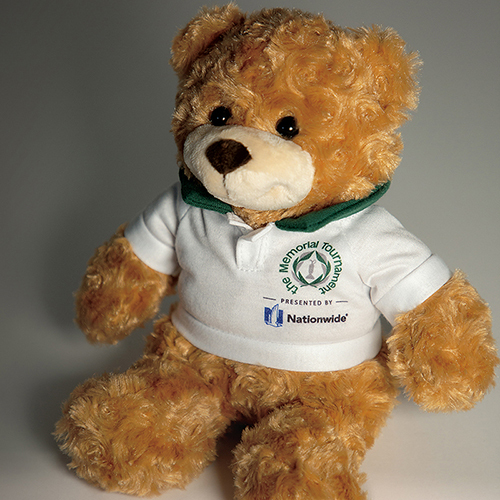 A bear can be taken home or donated back to a child at Nationwide Children's! 100% of all proceeds from the bear sales stay in central Ohio to benefit the patients of Nationwide Children's Hospital. Click here to purchase Irv! Bridge St. – 299 W. Bridge St.
Canal Winchester – 6095 Gender Rd. Gahanna – 1365 Stoneridge Dr.
Grandview – 1375 Chambers Rd. Henderson Rd. – 1955 Henderson Rd. Hilliard - 4656 Cemetery Rd. Parsons Ave. – 1441 Parsons Ave.
Pickerington – 1045 Hill Rd. N.
Polaris - 1177 Polaris Pkwy. Powell – 3975 W. Powell Rd. Sawmill Rd. – 7625 Sawmill Rd. Schrock Rd. – 55 W. Schrock Rd.